Image: Larry French/Getty Images for WS Productions. On Saturday, the world lost a true American hero when John S. McCain III lost his battle with brain cancer. McCain, a six-term Arizona senator and two-time presidential contender, was 81 when he died at his Arizona ranch, surrounded by loved ones. According to McCain’s office, he died at 4:28 p.m. local time. McCain had been open about his health since being diagnosed in July 2017 with a malignant and particularly aggressive form of brain cancer called a glioblastoma. Over the past year, he periodically underwent chemotherapy and radiation. On Friday, his camp announced that he would be stopping treatment altogether. McCain’s daughter, Meghan McCain, shared the news of her father’s death via a lengthy and emotional statement on Twitter. Cindy McCain, the senator’s wife, also took to Twitter to mourn her loss. “My heart is broken. I am so lucky to have lived the adventure of loving this incredible man for 38 years. He passed the way he lived, on his own terms, surrounded by the people he loved, in the place he loved best,” Cindy said. A lifelong public servant, John McCain earned a reputation as a “maverick” — a conservative who was willing to cross partisan lines to defend the democratic principles he’d devoted his life to protecting. He served in the U.S. Navy, notably surviving more than five years of torture as a prisoner of war in Vietnam. Despite the inhumane treatment he suffered during that time, McCain rejected early release in the name of honor and out of loyalty to his fellow prisoners of war. On Saturday, former president Barack Obama paid touching tribute to his former political opponent (McCain memorably refused to personally disparage Obama when they ran against each other in 2008). Former vice president and Delaware senator Joe Biden, a close friend of McCain’s whose own son succumbed to brain cancer, also issued a statement. 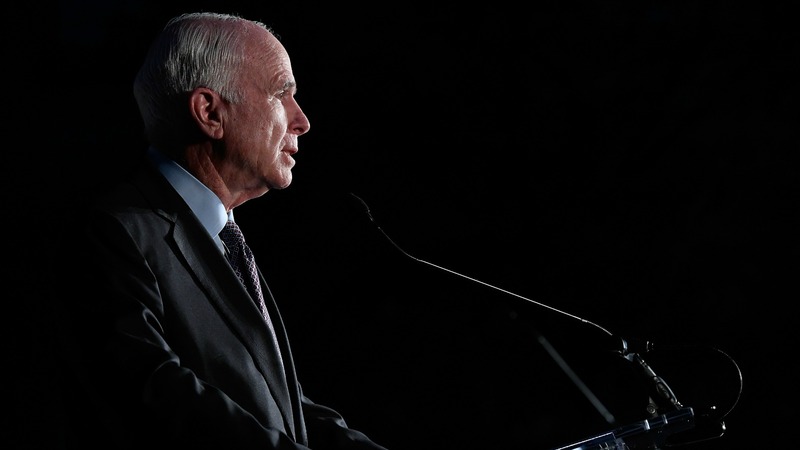 “John McCain will cast a long shadow. His impact on America hasn’t ended. Not even close. It will go on for many years to come,” Biden said in his statement. Former president George W. Bush, for whom McCain was an outspoken advocate, called his dear friend "a patriot of the highest order." The outpouring of public support for the McCain family and admiration for McCain himself also came from Hollywood. Celebs flooded Twitter and Instagram with condolences. John McCain. When I was trying to get an anti shark finning bill passed through the Senate with @oceana not only did he sit and listen to me but he exceeded our allotted 8min time window and took us on a tour of DC for over an hour after he heard I’d never been. Such an amazing man. A hero and a voice that will be sorely missed. ❤️ ps. The bill got passed because of him that day. Asked recently how he would hope to be remembered, McCain said, “That I made a major contribution to the defense of the nation.” Mission accomplished, good sir. Rest easy.